Handouts and presentations from the 2-day UK DDP Conference in Walsall, Birmingham, England 10th-11th November 2014 are now available to download on the website. To view them visit the Resource Library in the Resource section. Either click on “Conference Proceedings” under Materials or click on “DDP UK Conference Proceedings 2014” under Subjects. 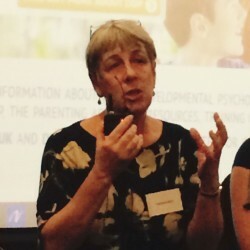 Edwina Grant, Jan Ross and AMICUS foster care agency spoke on how DDP principles are being put into practice across the UK by adoptive parents, fostering agencies and in residential homes. Joy Gamble presented about Dyadic Developmental Psychotherapy as did Viv Norris who focused on blending DDP and Theraplay during transitions from foster care to adoptive care. Kim Golding also spoke about the importance of developing narratives in DDP and read from her recent book Using Stories to Build Bridges with Traumatized Children. Dan Hughes and Jon Baylin, from the States, focused on how current knowledge about the brain informs how we help children move from mistrust to trust during parenting and therapy. Power point slides from Dan and Jon’s Presentation are available as downloads in DDP Network’s Resource Library. The conference was sold out with 125 delegates on Day One and 170 on Day Two. 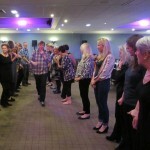 View some conference photos in DDP UK Latest News including the evening’s Scottish dancing.